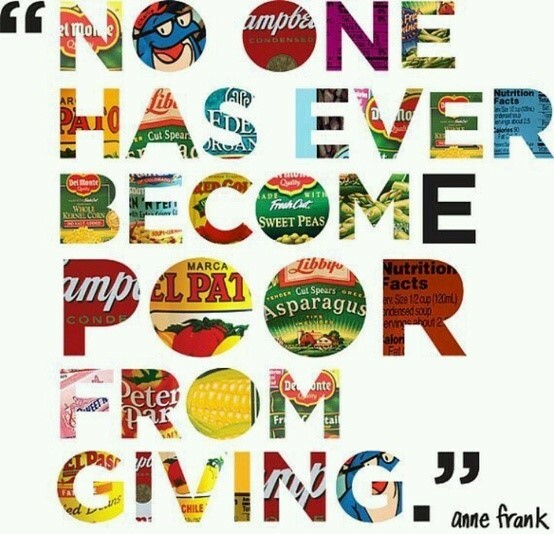 11 Dec No one has ever become poor by giving. No quote has ever resonated in my heart and soul as this one does – especially during this time of the year and after the year this country has endured from natural and calculated disasters – from Hurricane Irma to the devastating fires in California to the shootings in Las Vegas. This has truly been a difficult year for so many of our neighbors, friends, family and patriots. While we have much to be grateful for there are those today that are still trying to pick up the pieces of their lives and find a way to celebrate the holidays in a meaningful way. And truly they need every bit of help they can get. While the holidays are also my favorite time of the year, I think this year in particular is the time to reflect on all the things we are blessed with and challenge ourselves and each other to find ways to help those who are truly less fortunate – whether it be by volunteering, participating in a local food drive, making a donation to your favorite charity (in your name or for someone else) or sponsoring a family. Even the smallest gestures today go a long way – and as Anne Frank stated “No-one ever has ever become poor from giving.” In fact, it is probably in giving that we receive the greatest gift. When I originally sat down and started thinking about what I wanted to convey in this holiday blog, I thought about why we started giving gifts in the first place. Of course, historically speaking it actually dates back before Christ was born and the “Three Wise Men” to the Romans and their need to celebrate just about anything. But clearly it has now evolved into something so commercialized that the true purpose behind giving gifts often seems lost. Now it is all about outdoing the neighbors, finding that impossible toy at the top your child’s wish list on e-bay at 4 times the original cost, or just remembering to stay politically correct and instead of using Merry Christmas, Happy Hanukkah or Happy Ramadan we say “Happy Holidays” as a way of including everyone. Even poor Santa has undergone a “politically correct transformation” in the fear that his obesity has set the wrong impression. Many marketing agencies are now featuring a “leaner and healthier version” of Mr. Claus. Which certainly begs the question – what on earth are we teaching and creating for the next generation? This holiday season, think about those who are in need. You may not receive a personal “thank you” or acknowledgement from them for your gift of time or donation – and you have to trust that it was appreciated. For some this is tough – but your spirit and heart will feel better and the knowledge that you gave it freely should be recognition enough. Many of our local partners in Dunedin and St. Petersburg, and I am sure throughout the country, this year are supporting their local communities in local food drives and other charity events. Just to mention a few – Caledonia Brewery is doing Bad Santa Pictures (adult pictures with Santa) to raise money for the community, a food drive and has adopted a family in need. Cueni and Soggy Bottom are planning on doing similar events. 3Daughters in St. Petersburg is hosting Santa pictures on December 10th and has joined with the community for other charitable events. As the holiday approaches, I encourage each of you reading this to get out of your comfort zone and do something for others. The opportunities are endless and the need has never been greater than it is today whether you stay local or help those in need throughout our country. May you find the gift to give that gives you inner peace and happiness and may the blessings of this holiday be yours to share!